The most spectacular place anywhere! Great room with a fantastic view over the indian ocean. Very lovely christmas things. Just a peaceful place to be and spend time on our honeymoon. Paradise! Aslight of delightful, magical heaven on earth. We’ll be dreaming of coming back here everyday untill our return. Thank you for the fantastic, friendly attention to all the staff. Thank you all for a wonderful four days. Don’t think I have ever seen Eric so relaxed! !We appreciated all your hard work and those little touches that make this such a special place. Enjoyed your company too and the gastro evening was a great success. We will have to diet before we come again! We will be back very soon and will bring friends to share it with next time. 6 weeks of sheer bliss! This is our 3rd stay at the best guest house in South Africa.Wayne & his staff are just fantastic. They have made us feel so much at home. We can’t wait to be back with our best friends in Knysna. Depression is setting in already. We tried to steal Jasmine & Jessica but we got caught. What lovely dogs. We will miss you all so until next time – many many thanks. We love you. +++ Nice View +++ perfect breakfast +++ tasted the best restaurants +++ very nice driver Cedric +++ good music +++ lovely decorations +++ friendly staff. What a stunning place to start our lives together. Thank you for making our honeymoon extra special. Thanks for the lone of your chandeliers, they held up good. The room wow! stunning. The company great. Everything was absolutely puurect. We will be back!!! PS: Just remember Wayne and Raeleen, no down grades, when we call for a booking, you know exactly where we want to be no exception. Thanks again guys, see you soon! Even though it was only one night we spent here – it was perfect!! We’ll definitely be back! We can’t wait to share this GEM of Knysna with the rest of the world. Thanks for your warm welcome, an amazing place with the best ocean view of S.A. We enjoyed our dinner and we’ll love to come back again. Special tanks to all the staff. The most astonishing place I’ve ever seen!! Absolutely breathtaking views! Beautiful internal decorations.We’ll be back one day! Thank you for your kind and warm hospitality! This is our second stay. We hated it the first time + we hate it even more now. This is because after leaving we are totally + utterly depressed because we know that every guest house after The Alexander is going to be disappointing . Where are the other 2 stars? There is insufficient differentiation between The Alexander and everything else. The staff are wonderful + could not do enough for us. We look forward to our next stay for two whole months in September . Until then – chow! PS. We’ll miss you all specially the puppies! We spent a wonderful 2 nights here as part of our honeymoon, and we were spoilt rotten! We love the decor, food (especially banana bread), atmosphere, pets and hosts. Thanks for a memorable stay. Well what can you say the Alexander is perfect! The attention to detail in every way cannot be matched. The room was so lovely we didn’t leave it in the evenings. Wayne and all the staff have clearly worked hard at creating such a wonderful place to stay, just sorry it’s not longer. Overwhelmingly breathtaking place. Very friendly and laid back atmosphere. All staff were great & always had a smile on their faces! Fantastic place for our honeymoon, one of the best places we have stayed in, Knysna is awesome! What a whirlwind trip – although we were only here for one night we had a wonderful time – the views were magnificent, the room extravagance, the service outstanding – we really like the personal attention + your eye for detail. Thank you! People like differentiation, people like to express their unique views, to differentiate from the others. The Alexander is the way how to unify people’s view, opinions. So even when we would like to express something unique and different than the other guests, we simply can not! Our view is an extract of guests views wishing The Alexander before us, Excellent, perfect, THANK YOU!We will return!! Words fail us. The most relaxing, welcoming & friendly place we have ever stayed. An outstandingly beautiful home. Thank you for sharing it with us. We will hopefully be back in the not to distant future. Seven days and seven nights of bliss. The hospitality of your team and your home was just amazing to say the least. We will be back for more, for sure. All the best for your future success! After 2 weeks @ your home, we’ve sadly off. Once again we had the most enjoyable & welcoming stay. 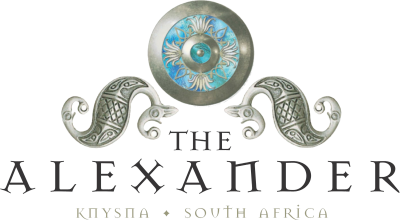 Knysna just wouldn’t be the same without the Alexander House. The Captain’s Suite was our home away from home allowing us to relax + sleep for hours. The breakfast spread was wide enough that we really needed to make choices, however the fish paste, cheese & onion marmalade always wound up on our plates. Both Xmas lunch & New Years Eve dinner party was festive + fun, especially the extra treats for Malcolm’s birthday. But more importantly, the warm + friendly staff made our holiday so comfortable & easy to play golf, eat fresh food & drink some of SA’s best wine. Thanks to Wayne, Raeleen, Cedric & the staff our holiday will be one to remember for times to come. We look forward to coming back.